Unforgettable brick paver driveway leads you to this rare Ranch in The Farm at Arapahoe. This Oakwood designed home features a grand courtyard entry with double doors leading to a formal dining room. Gourmet kitchen with huge island, new double ovens, stainless appliances including new refrigerator, six-burner gas stove & walk-in pantry. Separate large laundry/mud room with tons of storage. Cozy dual-sided fireplace between living & family room with French doors open to brick patio, pergola and deck spanning back of home. 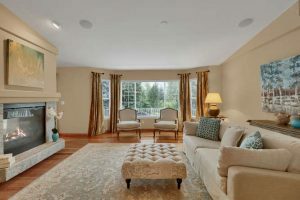 Large Master Suite with fireplace, walk-in closet with patio access. Tile in entry, dining room, and kitchen. Cherry hardwoods in family room, living room. Unconventional 4th bedroom or optional den/study. Quiet cul-de-sac with easy-to-maintain yard. Unfinished basement is a blank canvas perfect for finishing. 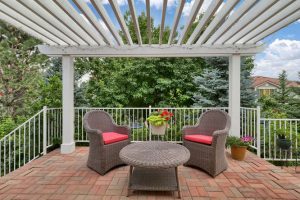 Cherry Creek schools, walking distance to Regis Jesuit High School. Good location for shopping, restaurants, theater, and new community rec center.